UMSL provides a wide variety of on campus housing options for both under and upperclassmen. Currently, approximately 1200 students live on campus. Oak Hall, Villa Hall, Villa Hall North and Mansion Hills are all run by our Office of Residential Life & Housing. 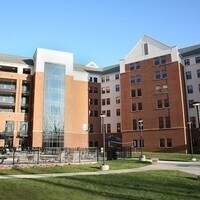 University Meadows is an additional on campus apartment complex option located on South Campus. Winter Olympics--Minute to Win It!